Oh no, not another cure for cancer. It’s not another laetrile is it? It was April Fools’ Day 2007 and an op-ed article published by The New York Times entitled “Patents Over Patients” by Ralph Moss, noted critic of the cancer industry. But there was no fooling about what Mr. Moss wrote about. He chastised the cancer industry for ignoring an off-the-shelf molecule initially produced in the 1940s called 3-bromopyruvate (3-BP) that had been found to dramatically reduce the growth of human tumors implanted in animals and has produced remarkable cures in a small number of human cases but had yet to be tested in a human trial. That was seven years ago. The initial animal lab discovery was published in 2004. That was 10 years ago. A decade has passed since that first animal lab experiment and humanity is still waiting for a human trial to commence in what may be THE CURE for cancer. The delays seem to be more commercial than scientific. Researchers have scrambled to make patentable analogs (synthetic look-alike molecules) that work better or at least do the same thing. It appears millions of cancer patients may be needlessly dying while researchers battle it out on the commercial front to gain patents. Laboratory researchers and clinical investigators continue to refer to 3-bromopyruvate (3-BP) as new. But it is an old molecule that had been overlooked until a Korean-born researcher, Young Hee Ko, conducting research at Johns Hopkins University School of Medicine, demonstrated it eradicated advanced-stage liver cancer in animals without side effect. 3-BP simply zapped the energy out of cancer cells (but not healthy cells) and caused them to die in place. But modern oncology is dragging its feet, testing 3-promopyruvate in every form of cancer and exploring every possible mechanism before launching human trials. Has all this precaution been necessary when helpless patients with advanced-stage cancers that had failed conventional cancer treatment could have been given the drug long ago? The idea of non-toxically killing cancer cells and leaving healthy cells unharmed would be the preferred way to treat cancer. Current chemotherapy and radiation treatment kills tumor cells and healthy tissues leading to serious side effects, one being death, often from treatment-induced heart failure. The FDA approves chemotherapy drugs if they temporarily reduce the size of a tumor by 50% and may not even contribute to survival since drug resistance inevitably sets in. An estimated $100 billion of chemotherapy drugs are sold annually worldwide. [Drugs.com] The cost to treat 1,660,290 newly diagnosed cases of cancer annually in the US [American Cancer Society] with 3-BP for 90 days at a cost of 70-cents per day would run about $104 million, almost a thousand times cost reduction. Despite the fact 3-bromopyruvate has been reported to be non-toxic and without side effect (“no apparent harm to other organs” – Cancer Research July 15, 2002; “cancers eradicated without apparent toxicity” –Biochemical Biophysical Research Communications Nov 2004; “little or no effect on normal cells” – Journal Bioenergetics Biomembranes” Feb 2012; “non-toxic when given systemically” – BMC Research Notes July 17, 2013), patent applications appear to make claims to eliminate minor side effects such as stinging upon injection. Who cares about the sting when patients are on their deathbed? Good God, don’t “compassionate use” guidelines permit 3-BPs use on a case-by-case basis? By 2012 a small group of patients were reported to have undergone 3-bromopyruvate treatment with a patented formulation developed by Dr. Ko. Yvar Verhoeven was the first person to undergo this groundbreaking treatment. Mr. Verhoeven had inoperable liver cancer that had spread to other organs and other drugs had failed to slow the growth of his cancer. He recovered sufficiently to tour the United States and make a presentation with Dr. Ko. But while the cancer had been eradicated he succumbed to liver damage caused by the prior tumor a year later. [Cancer Compass April 19, 2012] But other unreported cases have been successfully treated and are living cancer free today. While there is little argument these are likely improvements in 3-BP therapy, the patent application itself includes embodiments for oral administration that would not require buffering. It appears 3-BP can be used safely on an as-is basis today. It is just an analog (molecular look-alike) of lactic acid. But are doctors attempting to cut themselves in to injection fees when oral dose pills would do? No one is saying. Early reports claim 3-BP inhibits a key enzyme, hexokinase, which normally promotes the use of sugar for cellular energy rather than oxygen. [Journal Bioenergetics Biomembranes June 2007] But the developmental drug company that is attempting to begin human trials emphasizes its drug is an inhibitor of a different target enzyme – GADPH (glyceraldehyde 3-phosphate dehydrogenase), suggesting a “multi-pronged assault on cancer cells.” [Anticancer Research Jan 2013] It says its “core technology and patent protection relies on both the novel compound (called PSL-001) and targeted regional delivery of the drug.” But won’t unaltered 3-BP do? Plain 3-BP inhibits GADPH as well. The delivery system is just an intravenous infusion. It all appears to be a bunch of jockeying to make billions on a simple non-toxic molecule that can be injected by a home care nurse or even the patient. PET (positron emission tomography) scans are appropriate to visualize tumors for 3-BP treatment because PET scans actually detect abnormal cells that utilize sugar instead of oxygen for cellular energy. Patients who undergo PET scans are given a small amount of radioactively labeled sugar that accumulates at the tumor site. [National Cancer Institute] The widespread use of PET scans is a tacit admission by modern medicine that “sugar eating” rather than “oxygen burning” is the primary driver of cancer. If 3-BP is so non-toxic to healthy cells (it cannot enter a healthy cell), why not skip cancer detection and screening programs altogether and periodically administer this cancer remedy in high-risk groups, namely older adults? Cancer is largely an age-related disease. Adults could take 3-BP just like they do their daily multivitamin. What harm could come of it? Cancer could be eradicated for good. If there is no harm to its use in healthy persons, and it is dirt cheap to make and what are they going to do with the contrived claim that new drugs require $1 billion of research and development before they gain approval for widespread use? 3-bromopyruvate is an off-the-shelf chemical that sells for less than a penny per milligram. [Santa Cruz Biotechnology Data Sheet] Note: it is only available for research purposes. My prediction is that oncology centers will refuse to join in human clinical trials knowing it will put them out of business if 3-BP is as effective in humans as it is in lab animals. Even if 3-BP does gain FDA approval, it is more likely that non-oncologists, those who have nothing to lose financially such as general practitioners, will prescribe and administer it. That is what is currently happening with a class of anti-cancer drugs, monoclonal antibodies Avastin and Lucentis, that are employed to recede new blood vessels that invade the back of the eyes for a disease called wet macular degeneration. These two drugs cost over $2 billion to inject into the eyes on a monthly basis. Eye doctors and the FDA are shunning an inexpensive nutraceutical matrix that has been shown to inhibit growth factors that cause new blood vessels to form when the retina becomes starved for oxygen. Careful analysis shows there are three ways to halt or slow the use of sugar by cancer cells for growth. 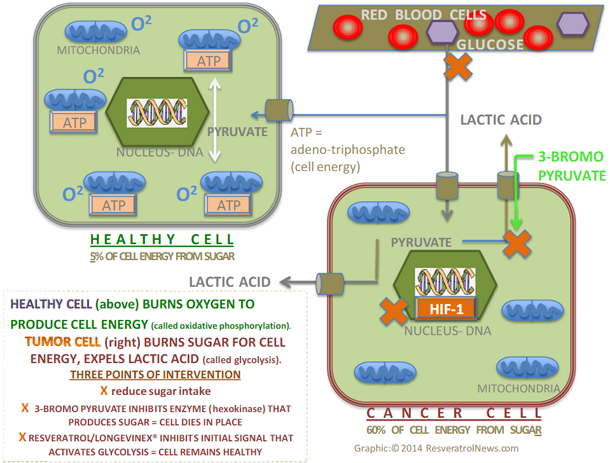 (1) Limit the amount of refined sugar in the diet, a practice that also appears to be ignored by oncologists; (2) use 3-BP to inhibit hexokinase, the key enzyme that promotes use of sugar for cellular energy in cancer cells; or (3) inhibit the initial signal that signals living cells to use sugar rather than oxygen for energy. That initial signal is produced by a gene called hypoxia-inducing factor-1 (HIF-1). [Bioscience Reports Nov 15, 2013] Hypoxia is a state of oxygen deprivation. The very same nutraceutical mixture that has been reported to spare hopeless patients from loss of vision was found by National Institutes of Health researchers to inhibit the key growth factor (vascular endothelial growth factor or VEGF) by profoundly down-regulating its controlling microRNA 20b by -1366 fold. [PLoS One Dec 23, 2010] The nutraceutical mixture may also be an incomparable anti-cancer agent. The FDA denied the petition claiming it was a way to circumvent its New Drug Application process. [FDA Petition] But because of the delay, thousands may be needlessly going blind. A drug trial of the nutraceutical would cost an estimated $2 million and take two years to complete and it is unlikely that eye physicians would even cooperate in recruiting patients for such a study. Furthermore, the FDA drug approval process requires comparison with an inactive placebo, which would be unethical. It would put patients at undue risk of losing their sight. Only patients who failed drug treatment, which serves as a comparison, would be recruited for study. When the National Eye Institute commissioned a study to determine if Avastin was as safe and effective as a much more expensive drug Lucentis, ophthalmologists drug their feet and wouldn’t recruit subjects for the study. Eventually a study was completed two years late and it showed that Avastin is as effective as Lucentis but at far less cost. [New England Journal Medicine June 19, 2011] However, the drug company that markets Avastin also markets Lucentis and it chose to file for FDA approval only for the more expensive drug. This represents gouging of Medicare funds. Modern medicine has a propensity to run up the bill by preferentially adopting expensive therapies and shunning those that are more cost effective. In this instance, two of the most feared maladies, blindness and cancer, remain unconquered but certainly well treated. Who outside of God can remedy such a situation? Congress is bought off so don’t think an appeal to Washington DC will result in any change. The gouging of Medicare funds to treat macular degeneration with the more expensive rather than the less expensive drug continues. Bill Sardi has a commercial interest in nutraceutical products.